The national fervor of the midterm elections has reached the Texas senate election. Incumbent Republican Senator Ted Cruz faces strong opposition from Democratic Congressman Beto O’Rourke, an underdog whose grassroots-style campaign and values stand in stark contrast to Cruz’s message of conservatism. Cruz’s experience in the Senate and conservative stance make him popular among Republican voters and some Independents; aligning himself in support of the current Republican majority in the Senate is substantial to voters who want a conservative senator serving Texas. O’Rourke, on the other hand, has run a unique campaign – he has accepted no money from political action committees (PACs), organizations that raise money to elect/defeat candidates, but has raised more than $38 million in donations, energizing a surprising number of Texans and making a name for himself nationwide. Emphasizing a commitment to the people, he markets his progressive views as being beneficial for all Texans. O’Rourke has held town halls and rallies in all 254 counties of Texas, pushing the message that he would be a senator committed to all people of Texas. This message in particular is primarily what earned him an endorsement from the Houston Chronicle, a paper that endorsed Cruz in 2012, and the Dallas Morning News, the newspaper with the largest circulation in Texas. Locally, O’Rourke has held rallies at the University of Texas at Dallas on Oct. 6 and in The Colony on Oct. 20, campaigning on his promise to represent all Texans. “A lot of politicians try to say they’re ‘for the people’, but I really do think Beto is for women, for LGBT folks, for immigrants, for working class people, for everybody,” O’Rourke campaign volunteer Dr. Michael McCutcheon said at the O’Rourke rally in The Colony. Despite campaigning on policies not typically shared across the aisle, O’Rourke believes his positions can apply to all Texans and advance Texas. O’Rourke, if elected, plans to continue to hold town halls to stay in touch with constituents and be held accountable. Cruz has run his campaign presenting himself as a protector of Texan liberty, standing for preserving conservative ideology and economic policies. 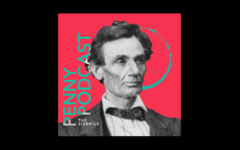 He prides himself as supporting Republican policies that have seen job growth and rising wages under their implementation, such as tax cuts. “The Republican platform is an effort to get the government out of the lives of the people. If people stick with what’s on the ballot, we will continue to see economic growth and opportunity,” Coppell Republican Club President Davin Bernstein said. Bernstein attended a Cruz rally in Fort Worth on Oct. 19. Many nationwide debates regarding immigration, healthcare, gun control and education have made their way into the Texas senate elections. On immigration, O’Rourke aims to preserve the DREAM Act – a plan to grant legal status to undocumented immigrants who were brought to the United States as children and have grown up here – shuns migrant detention centers and calls for providing immigrants with paths to citizenship. Hailing from a border city, El Paso, O’Rourke emphasizes the sentiment of cooperation between Mexicans and Americans, which he has experienced throughout his life in his home. Cruz, however, emphasizes his position on secure borders given the legislation he has supported in the Senate, gaining the support of numerous border patrol officials. He supports President Trump’s border wall proposal. 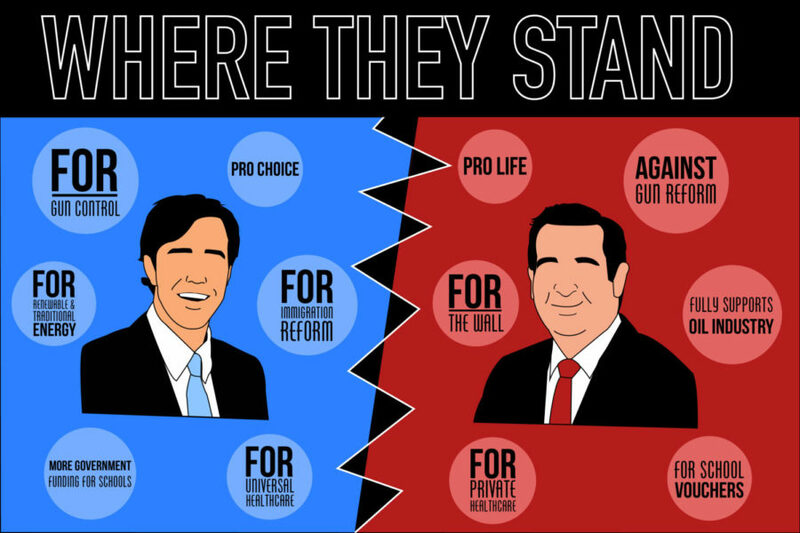 Cruz has also been highly critical of the Affordable Care Act (ACA), voting to repeal the entire act. O’Rourke, on the other hand, calls for universal coverage through a single-payer or dual-payer Medicare program and improving the ACA. Through this, he aims to change the fact Texas has one of the highest maternal mortality rates and is a state with one of the least insured populations. The candidates’ proposals towards education also differ sharply, with Cruz in support of school vouchers and dismantling the U.S. Department of Education (citing a disapproval of government handling of local education) and O’Rourke in support of universal pre-kindergarten education as well as increased teacher salaries, as teachers often have to work multiple jobs to make a living in Texas. The issues relating to energy and the environment have been brought up as well; Cruz sees Texas’ future in fossil fuels and supports lifting of regulations on the fossil fuel industry intended to promote clean energy, while O’Rourke wants to combine traditional and renewable sources of energy for use in Texas as well as strengthen the Environmental Protection Agency. On social issues, Cruz and O’Rourke fall in line with their party’s views on issues such as abortion and Planned Parenthood funding – against and for, respectively – and gun control – against and for, respectively. Early voting began on Monday and voter turnout in Texas has hit record levels, garnering national attention. Dallas County, for example, on Monday broke its record from the 2016 presidential election, with a staggering 81,723 people voting at the polls in-person and through mail, according to the Dallas Morning News. Surely enough, voter energy is high on both sides – 72 percent of Democrats and 68 percent of Republicans nationwide have expressed enthusiasm for voting according to an NBC/WSJ poll, making the election even more highly contested. A Get Out The Vote poster shows off O'Rourke's campaign in TCBY, a local frozen yogurt shop and Beto Pop-Up office. Volunteers come here to collect materials, get trained, and call voters to provide them with information about when and how to vote, along with reminders to go to the polls during Early Voting and on Election Day. For the midterm elections in November, Texas is a major battleground for both sides. With so many opposing views involved in the election, many wait in anticipation for voting results. Recent polls, such as the Midterm Election Poll conducted by The New York Times, show Democratic Congressman Beto O’Rourke closely competing against former Republican Senator Ted Cruz, with single-digit percent differences between the two candidates for Texas senator. For Cruz, running as a Republican incumbent in red Texas makes him the favorite to win re-election. His traditional campaign includes tightly tailoring his outreach to specific conservative groups, which has been successful in the past. The American politician and attorney has served as the junior United States Senator from Texas since 2013, when he unexpectedly defeated David Dewhurst in the primary runoff and won the general election against Paul Sadler, John Jay Myers and David Collins. However, with O’Rourke trying to turn Texas blue for the first time since 1994, Cruz faces looming competition. With the help of many young voters, specifically those of color, O’Rourke sees a growing number of supporters across the state. What makes O’Rourke unique is his campaign, which has broken conventional rules. Instead of relying on political action committees and special interests, O’Rourke is organizing the largest volunteer-led Get Out The Vote (GOTV) program in the history of Texas. This enforces person-to-person conversations with O’Rourke supporters through rallies and volunteers, primarily providing them with information about when and how to vote, along with reminders to go to the polls during early voting and on Election Day. Commonly defined as a grassroots movement, this strategy uses the people in a given district, region or community as the basis for a political or economic movement. Using collective action from the local level, grassroots movements aim to elicit change at the regional, national or even international level. An example is O’Rourke’s 34-day road trip across the state, where he visited all 254 counties of Texas. Volunteers of the grassroots movement contribute in a multitude of ways. Beginning Oct. 5, O’Rourke’s campaign will run phone banks and launch block walks from a network of hundreds of mini-campaign offices called Beto Pop-Ups. Volunteers meet at the pop-ups to collect materials, get trained and then begin talking to voters. One example of a Pop-Up is near Coppell High School: TCBY. 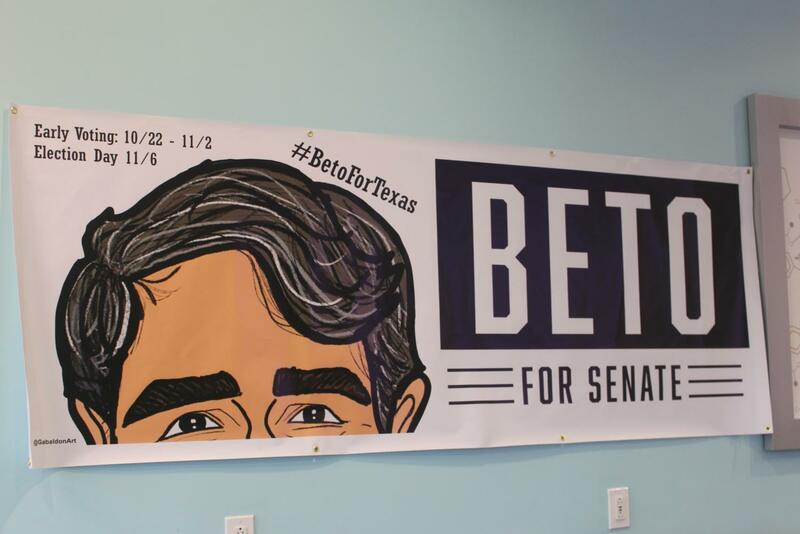 The local frozen yogurt store hosts a Beto for Texas Pop-up Office where volunteers help to get out the vote (GOTV) for O’Rourke. Open from 12 – 9 p.m. every day, this pop-up office displays the community participation shown from every part of Texas, including ours. “For Beto O’Rourke, I feel like he’s not afraid to stand up for what is morally right – which is why I chose to volunteer,” Carrollton Grassroots Pop-Up volunteer Victoria Rick said. All that is left is the outcome on Election Day Nov. 6. Early voting began last Monday. 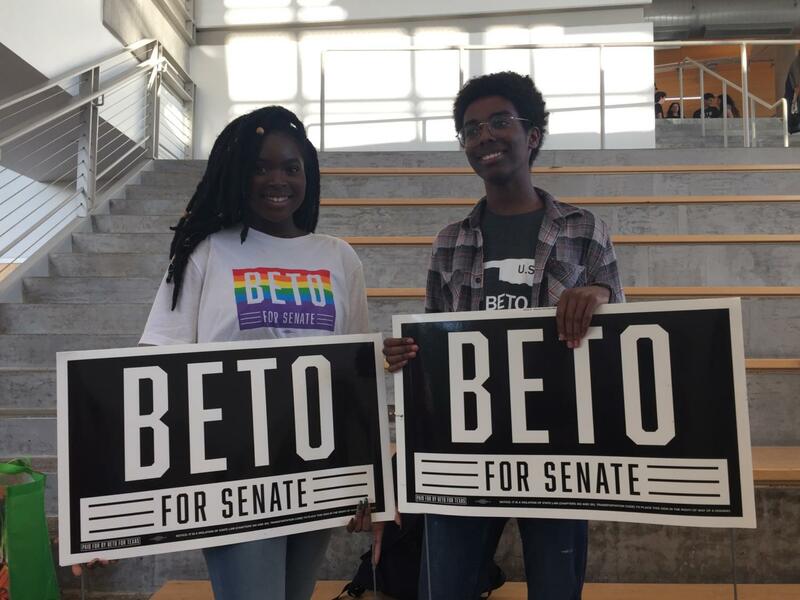 Ola Olaleye and Awab Ahmed show their support for Beto O’Rourke at his UTD rally on Oct. 6. UTD students and other members of the public attending to hear O’Rourke speak about his platform and the upcoming election. Coppell High School junior Carrie Sheffield has felt the nation’s fissure for years. The country’s divide reached her doorstep in 2016, and like the Senate floor, ardent ideas have collided. Carrie’s mother, Shanna Sheffield, explained these disagreements do not negatively affect their relationship. 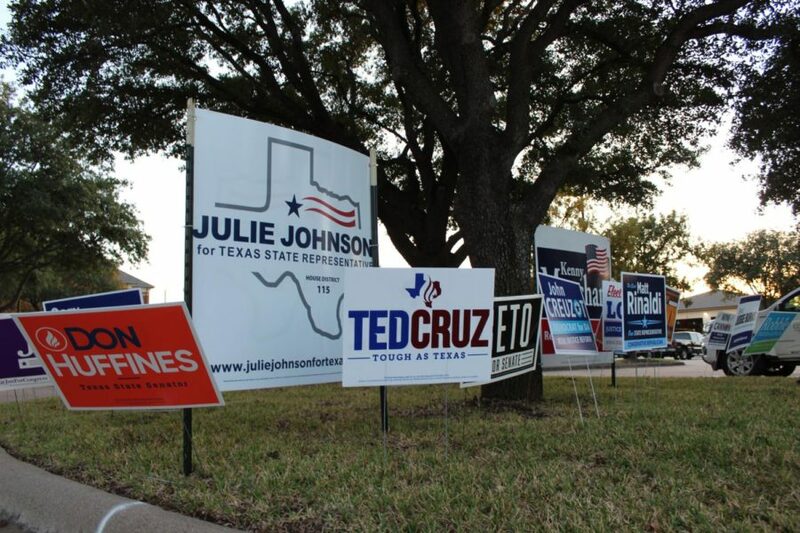 As plastic signs endorsing candidates permeate lawns throughout Coppell, students are solidifying their political views in the wake of the Texas Senate election. Some are mirroring the views of their parents, while others are creating their very own. However, it is certain for all that the race between Democratic Congressman Beto O’Rourke and current Republican Senator Ted Cruz cannot be ignored. Carrie said she would vote for O’Rourke if she were of age, and she owes the development of her ideas that contradict those of her parents to her personal research. Much of her research includes visiting the websites of political candidates and reading about their stances on issues. Carrie said she especially butts heads with her parents in the topics of immigration and abortion laws. Furthermore, Carrie thinks women should have control of their own bodies and easy access to Planned Parenthood. Her mother is against abortion. Coppell High School junior Ryan O’Toole has also developed his own political views, but contrary to Carrie, his mirror those of his Republican parents. These Coppell residents all agree that it is important to explore all viewpoints while forming your own political opinions. The current political climate has parents around the city and nation wondering how much free reign they should give their children and at what age they should be exposed to the “real world”. Alexander-Blythe motivates her students and her own children to be active in the world around them. “My goal is to raise my child to think, not to teach him what to think,” Alexander-Blythe said. The level of how much impact politically-knowledgeable young people have had so far has been debated. But a hardly disputed claim is that voting is essential for people of all ages. Dozens of celebrities including Beyonce, Taylor Swift, Gucci Mane and Ice Cube have encouraged young voters across the country to go cast a ballot. The two candidates themselves have called for participation. “This year more than any others the youth vote will decide an outcome that will not just affect Texas, but the whole country,” O’Rourke said. Alexander-Blythe thinks it is not only one’s civic duty to vote, but to cast an informed vote. Students at CHS are taking different paths when forming their political views. Which views will be implemented will not come down to who has the most yard signs, the loudest promoters or the prediction polls on their side. Election Day is Nov. 6 and early voting concludes at 7 p.m. Friday. Political signs are lined along the road to Coppell Town Center on Sunday, Nov. 4 for the upcoming mid-term election on Nov. 6. This election will determine which candidates will be elected at the local, state, and congressional level. This election season, public education funding has found a place among the most prominent topics in Texas. For the past several years, wealthy districts – such as Coppell ISD – have been trapped in a predicament between clashing financial state government laws, making funding and budgeting a challenge. 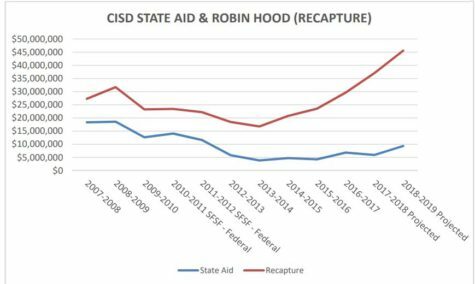 One of the biggest causes of this issue is the increasing recapture, commonly called the Robin Hood state program, taken from CISD by the state. Created in 1993, its goal was to allow the state to redistribute school tax revenue from high property value districts to districts with low home value and therefore bring balance throughout the state. It was initially successful, striking a balance between funding for wealthy and needy districts in Texas for more than a decade. This program meant less funding for Coppell ISD. However, over the years, state funding for CISD became a fraction of what it used to be, as the state of Texas expects the money from the rising high-value property taxes will fill the hole. Therefore, CISD’s funding went from the planned 50- 50 state funding and local contributions to only 10.8 percent coming from the state, according to CISD. To put things into perspective, CISD also gave 26.7 percent of its total funds as recapture at the same time. With the rapidly growing student population, CISD’s funds struggle to keep up with its costs. CISD is expected to keep educating a swiftly increasing population while its state aid lies stagnant, leading to less money to spend on its students. This short informational video from Raise Your Hand Texas further explains the situation. CISD Trustee Manish Sethi hopes to see changes in public school funding and the Robin Hood law following the midterm elections. Another campaign topic is the school voucher system. While often repackaged under different names, the general concept of a school voucher is the same: money paid by the local taxpayers supporting private schools instead of public. While most Democrats, such as U.S. Senate candidate Beto O’Rourke, have openly criticized and promised changes to the voucher system in place, Republicans, namely O’Rourke’s rival Ted Cruz, have been an avid supporter of it and plan to keep it. But for CISD, a public school district, the weakening of the vouchers law is the preferred outcome as it allows more money to flow to CISD. A school’s facilities, teachers and extracurricular opportunities all indirectly depend on receiving the necessary funding. In the end, the funds of a school can be the defining factor of the quality of education. Therefore, a decrease in funding for Coppell could most likely be proportional to the state of education for its students, placing itself in the center of a key debate by politicians. David Royer is a Coppell voter and the father of two CISD students. Royer also thinks an adequate number of teachers is a characteristic of a good school. The midterms determine the future of Texas and its students for the next two years, different candidates have different goals in mind regarding educational funding in Texas. The outcome of this years midterm elections may bring change in the education system, and CISD hopes it to be for the betterment of its funding.